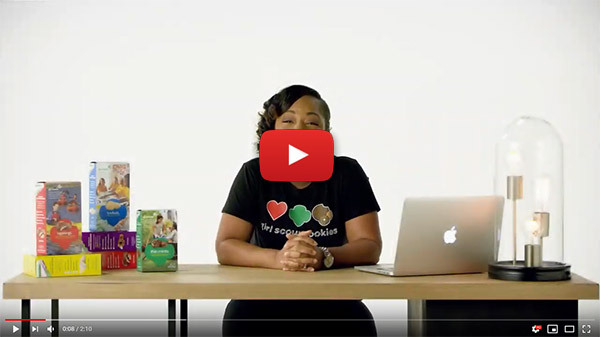 In the Girl Scout Cookie Program, your Girl Scout will have an opportunity to take the lead in running her own cookie business and realizing her own dreams. She’ll gain skills and confidence—and do all kinds of extraordinary things—and you’ll be able to support her every step of the way. Download the Girl Scout Cookie Family Guide to help her shine bright this cookie season. You are your daughter's biggest supporter. Here are some steps you can take to guide her through a successful Cookie Program experience. Sign and return the Parent Permission & Financial Responsibility Form to the Troop. Help her set practical and useful goals about what she wants to learn and earn. Sign up your girl for Digital Cookie and help her set those goals, send emails, share her digital cookie link, and even make a video! Be a champion for your girl! Allow her to do the ask but help her network. Check out these great tools (posters, door hangers, receipts, thank-you cards) to help you reach your cookie program goals, and rock this season harder than ever before. Show your Girl Scout spirit when taking Girl Scout Cookie orders by wearing your uniform. Cookie Customers look for blue, brown, green or tan vests and sashes to purchase cookies each year. Visit Badge & Sash to get in gear.